Last night on The Colbert Report, Marvel made an announcement we were all expecting: the new Captain America in the comics would be the Falcon. This is a pretty neat change from the status quo, giving Sam Wilson a chance to shine after the character's appearance in Captain America: The Winter Soldier. This is progress, right? Well, we tried to talk ourselves into the idea, but it's probably wishful thinking. 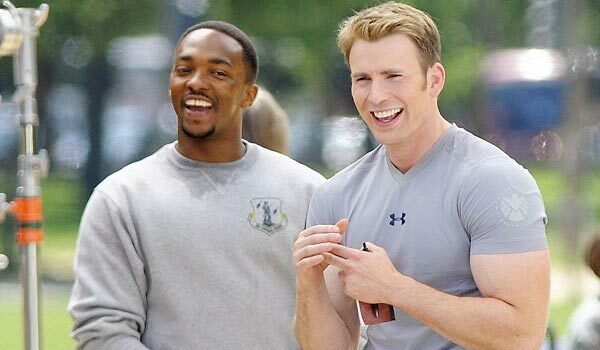 Anthony Mackie, who plays the Falcon in the movies, would be a GREAT Captain America, and it would be a nice surprise to see him take on the mantle when Chris Evans bows out. But as we mentioned in that original piece, it's probably not likely. And here are the main reasons why. 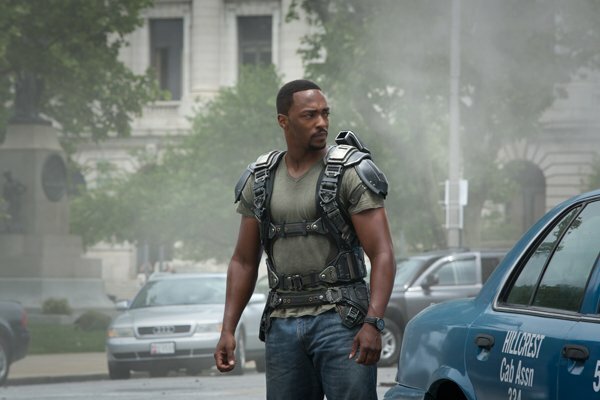 In Captain America: The Winter Soldier, Anthony Mackie's Sam Wilson is an everyday soldier who just happened to have developed fancy new prototype wings for use in combat. That's a far cry from the version established in the 1960's, when Sam Wilson was an actual superhero with powers all his own. And the reason why those powers didn't carry over to the movie is because 1) they're lousy, and 2) no one at Marvel can agree on them. 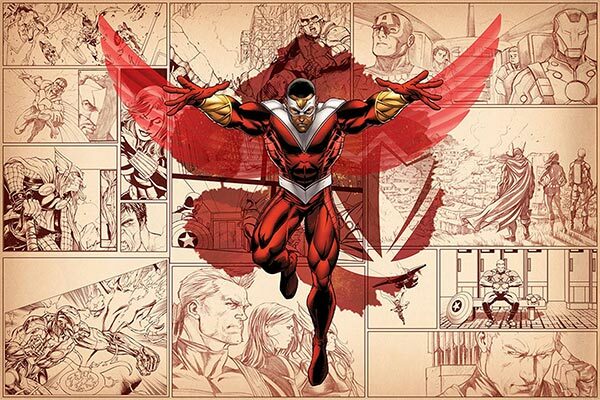 Falcon's initial ability, which has been downplayed in recent years, has been a telepathic link with his pet bird Redwing. Some writers used the relationship between Falcon and Redwing as just a friendly pet-owner bond. Others found that link so strong that Sam Wilson was classified as a mutant. It was this hint of supernatural ability that allowed the Falcon to be treated like another everyday hero, particularly when the Avengers would be faced with cosmic-level threats. By comparison, Mackie's Falcon is almost immediately taken out of the game as soon as his wings are singed, and appears pretty winded by the time Frank Grillo's Brock Rumlow challenges him to a one-on-one brawl. The chasm between literal wartime hero Steve Rogers and out-of-practice soldier Sam Wilson is a gap nearly impossible to close if the mantle is passed down. Winter Soldier introduced a Sam Wilson that, by all accounts, was already a pretty cool dude. Mackie's Falcon served his country, then returned home to work with veterans scarred by battle and unable to rejoin society. 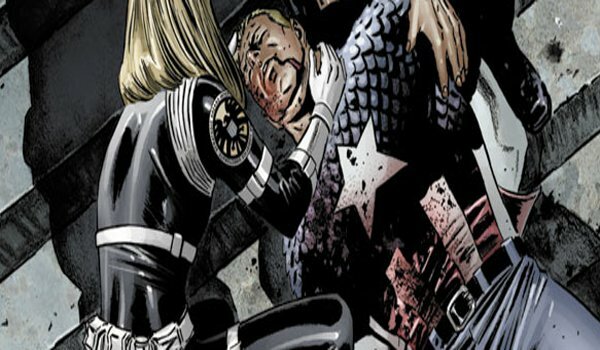 One could argue his initial bond with Steve Rogers was based on two soldiers who recognized the good in each other. Also, if the wings are anything to go by, dude's a pretty savvy inventor already. It's a little more complex in the comics. Sam Wilson came from modest means, serving as a social worker in his early days, which inspired him to become a costumed vigilante. But in the 1970's, this was retconned, altered so that it could be revealed that the Falcon has a shady past in organized crime, including pimping. It was a dark time. But the reason for this change was simple, if ill-advised: Wilson was already sort of a cool guy, so giving him a bit of darkness gave him something to redeem. Of course, he's pretty squeaky clean in the movies, so if Wilson were to wear the red, white and blue in the movies, he'd only be battling the pressure of filling Rogers' shoes. That's not exactly a compelling arc. Having Wilson become the new Cap in the comics just makes him the latest in a long line of Cap replacements. In the movies, it would just be one stupendous guy wearing the wardrobe of another. Anthony Mackie Is A Busy Dude! Look, few people during the Winter Soldier press tour were as enthusiastic about being a part of the film quite like Mackie. 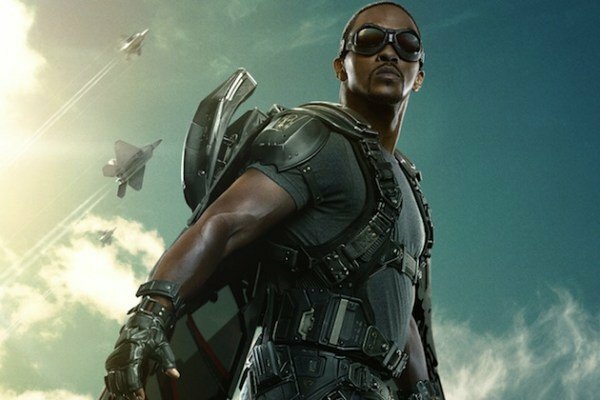 The gregarious actor has been outspoken regarding his desire to do more Marvel films as Falcon, as many as possible. Good for Mackie, making friends and influencing people. However, look around the Marvel onscreen universe. Most of the actors who make frequent, contractually obligated return appearances as certain characters are either megastar leading men who only take on lead roles, or character actors free to pop up in smaller films and supporting roles here and there. Mackie is the one guy who does both: the actor popped up in six films in 2013, he's got two more coming this year, and consistently shifts between the demands of tiny indies and massive studio films. A six film Marvel deal, particularly with Captain America so in-demand, isn't going to work with his typically busy schedule. What About The Winter Soldier? Ah, the massive caveat: it became public knowledge quite quickly that Sebastian Stan was signed for eight more films with Marvel after appearing in Captain America: The First Avenger. Chris Evans is obligated to appear in three more Marvel movies, but Stan has seven left: it makes a great deal of sense that Stan's Bucky is being groomed to replace Steve Rogers, which is exactly what happened in 2008 when Cap was "killed" (he got better). Of course, being signed to so many movies doesn't mean you're going to appear in all of them. 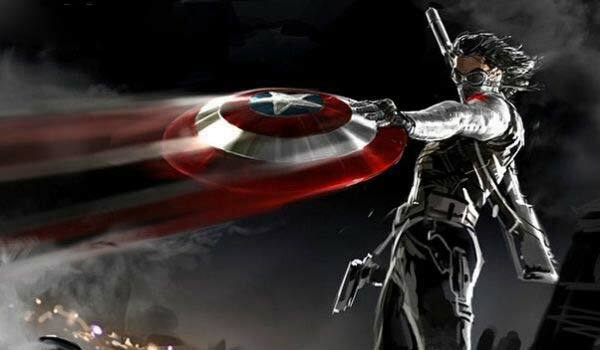 The die-hard fans are pretty much expecting that Bucky will become the new Captain America. They already pulled this off in the first film: when Stan's Bucky "died" you didn't need to know that he was signed for eight more movies to know he would come back. A curveball, like Bucky dying again, would instill some drama and intrigue to fans both old and new. Stan is not yet the type of recognizable face that Mackie is, but provided there's a Cap switch-over, there are years to make that change. In fact, if Black Widow has "red" in her ledger as she claims, then the Winter Soldier's file must be gushing blood. To have a brainwashed killer carry the shield is arguably more interesting than Decent Guy Sam Wilson. Why Cannibalize An Interesting, Historically Significant Superhero? Before The Falcon, black superheroes usually hailed from other countries, carrying names with "Black" affixed to them as if everyone needed a reminder. That all changed with the arrival of The Falcon, the comic industry's first African American costumed crime-fighter. Suddenly, fans had a hero on their hands who would go on to become one of the most beloved Avengers and even one of the celebrated Defenders. Sam Wilson has been places and seen things. The Falcon of the comics has five decades behind him before picking up Cap's shield, so his legacy is secure. But elevating Mackie's character to become Captain America so soon basically ignores this, basically erasing the accomplishments of a character that has existed since the sixties. Now, the argument can be made: is that history worth erasing? Despite his historical significance, has the Falcon been integral to the Marvel universe, or can we do away with his history? He's carried solo series' and been a key part of major storylines, but never the star. The Falcon never gets to take the winning shot, in other words. But it's hard to see Marvel making that argument. There's a better case to be made for Sam Wilson to remain the Falcon, writing his character in the movies to become a more prominent hero in the pantheon. Marvel isn't likely to deviate from the earlier comics in that manner quite yet, and when they finally do so, it won't be to basically eliminate the Falcon's history of serving on Marvel's front lines. Besides. We're talking about comic books here. When is change ever permanent?